I have always had a problem with Dana Andrews as an actor. For me, he lacks charisma, and (more often than not) is on the bad side of wooden. Sealed Cargo is a workmanlike addition to the Andrews canon- not the best thing he ever did, nor the worst. The film’s directorial credit goes to Alfred Werker, who managed to preside over some bizarre films in his nigh on 30 year career- not many directors can boast a c.v. including a classic pirate movie (Kidnapped, 1938), a Sherlock Holmes film (1939) and a Laurel and Hardy comedy (A-Haunting We Will Go, 1942). Given this generic disparity, whether Werker is an auteur or not is anyone’s guess. Given the way he directs, the answer is probably no. 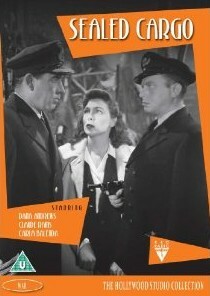 Sealed Cargo is a rather unusual film- it is typical B-movie fare, but its focus- essentially propaganda- means that by 1951 it must have seemed more dated than it does now if the time of its production is overlooked. By the early 1950s, Hollywood was a place of transition- science fiction films were just round the corner, as was Technicolor and a new generation of young actors like Brando and James Dean. Sealed Cargo is a bit like a museum piece, but, as with most museum pieces, there is still something there to kindle nostalgia- and there’s nothing wrong in that. ‘Sealed Cargo' is available on DVD from Odeon Entertainment.